Today is Samhain. It is one of the most important of the 8Sabbats as it is the Pagan New year. The wheel of the year has turned full circle and a new year begins. 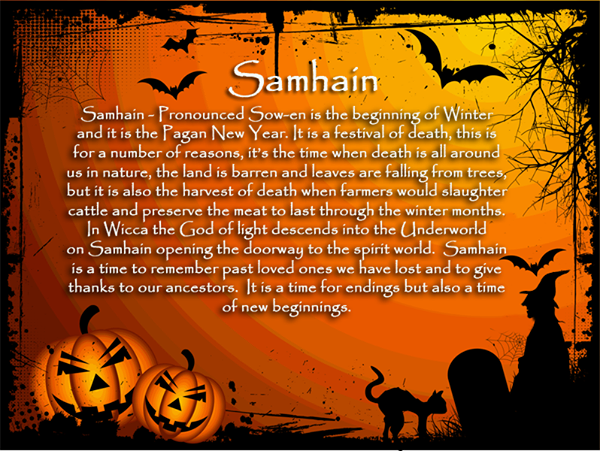 The word Samhain means Summers end. It is pronouncedSowin.Samhain is the third of the harvest festivals, only this isn’t a harvest of crops or grain it is the harvest of flesh. It was the time of year when farmers and families would slaughter cattle and preserve the meat to last through the cold winter months. 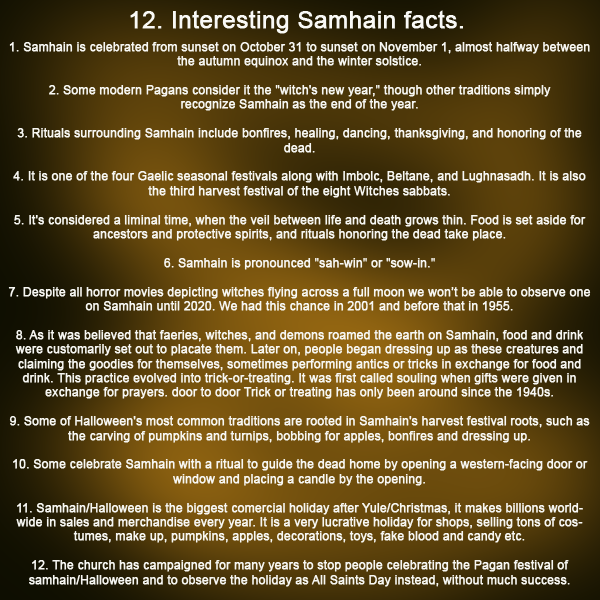 Samhain is a festival of death as it is the death of the year and of the waxing Sun. It is also the death of the earth when Plants, seeds, and acorns are now slowly descending underground to ready themselves to be reborn in Spring. Animals will start to hibernate, and the earth will appear Barron as it sleeps through the winter months. Earth energies are being pull inwards at this time, this is the time we should also be looking inwards at ourselves. Contemplate the year we have had and what lessons we have learned, whether they were good or bad, what can we take from them and use in the future. The God of the waxing Sun descends into the underworld opening up the veil between the two worlds of the living and the dead. 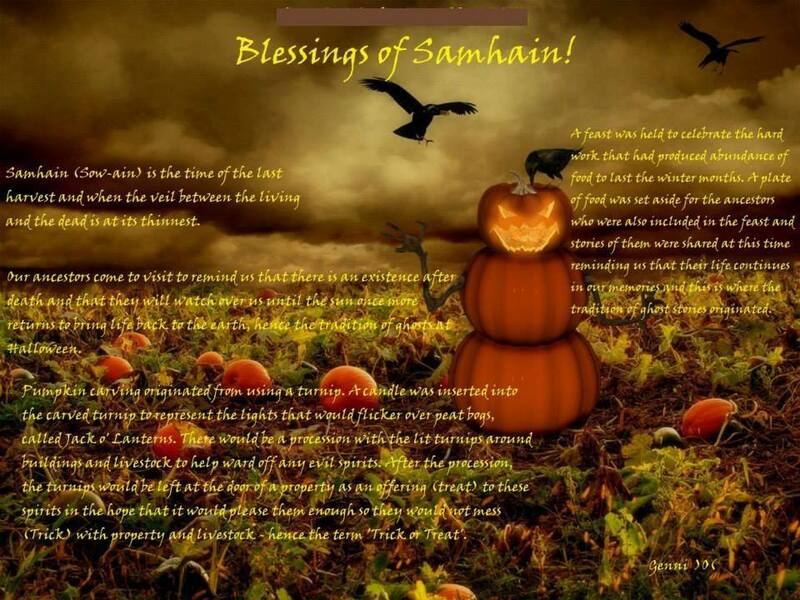 At Samhain spirits can commune with the living and visit us. We remember our ancestors and the people and pets who have died, we honor them by placing pictures of them on our altars and invite them to join us. We should also adorn our altars with seasonal fare such as fallen leaves, twigs, acorns, nuts, turnips, and pumpkins and offer these as gifts to the Triple Goddess who is now in her crone phase, she is the wise dark mother of knowledge and days past. 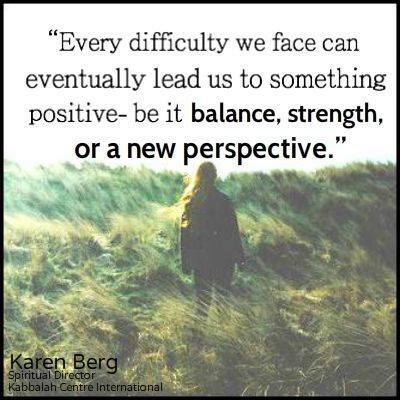 Although a time of death Samhain is also a time of fresh starts and new beginnings. It is a time of ‘out with the old and in with the new’ To start looking forward and to our future. 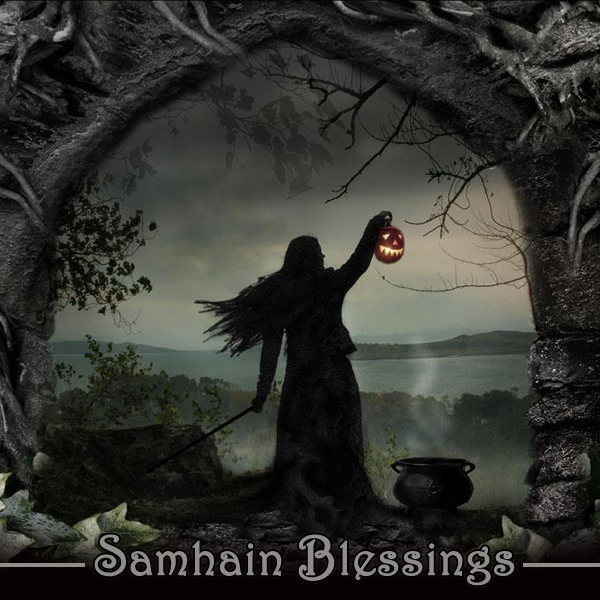 On Samhain we should light a fire as this is primarily a Celtic fire festival where the villagers and towns folk would light giant bonfires to say goodbye to the God of the waxing Sun and to thank the Goddess for her harvest of gifts bestowed upon the earth. There would also be big feast with stews, corn and breads and we would give thanks for people in our lives and show gratitude for all that we have, and we give thanks to the people who are no longer with us and invite them to join us at the feast. Light a candle tonight and put it at a window facing West, to light the way for our lost loved ones and invite their spirits to visit us. Today is a great time for divination, for doing tarot reading and looking to the future and asking ourselves how we can improve our lives and move forward for the coming year.